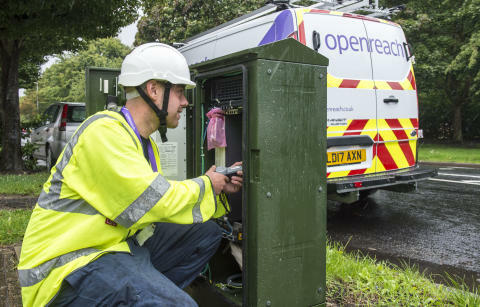 Openreach engineer Dominic Bowers at work on the Gfast rollout. New cutting edge broadband technology is heading to more of the South East as Openreach gets ready to make its new network available to another 31,300 homes and businesses there. People living in areas including Aylesbury, Byfleet, Cosham, Guildford, Maidstone, Slough, Southampton, Tunbridge Wells, Windsor and Woodley Berks interested in upgrading their broadband to the new service can see if they’re able to connect by entering their postcode into Openreach’s online fibre checker at openreach.co.uk. They are among 59 new locations across the UK set to benefit from next generation Gfast broadband technology* being used by Britain’s largest digital network builder. More than 370,000 homes and businesses will be able to order ultrafast broadband in these areas. It’s a further boost for the South East, which was also announced earlier this year as one of the regions to benefit from Openreach’s biggest ever recruitment of more than 3,500 trainee engineers. Around 450 are being hired across Berkshire, Buckinghamshire, Hampshire, Kent, Oxfordshire, Surrey and Sussex. The new network is more secure and reliable than existing technology. It uses special software that can detect and fix issues before customers even notice and provides a faster, more stable service. This makes it ideal for home workers and small business use, helping to boost productivity and, in turn, the local economy. Kim Mears, Openreach’s infrastructure development director, said: “Our engineers have been working across more of the South East installing cutting edge technology to make faster, more reliable broadband services available. We’re keen for people to check it out and experience the difference an ultrafast connection can make. The latest rollout is part of a much wider commitment from Openreach, who provide the telephone and broadband network used by the likes of BT, Sky, TalkTalk and Vodafone. An ambitious ‘Fibre First’ programme aims to reach three million premises by the end of 2020 – using ‘Fibre to the Premises’ technology – where fibre optic cables are laid from the exchange right to people’s front doors. Openreach wants to extend this rollout still further to around 10 million premises by the mid-2020s, and ultimately the majority of homes and businesses across Britain if it has the right conditions to invest. For an insight into how the ultrafast technology is already having an impact – take a look at our video case study here featuring Swansea based business Veeqo. *Gfast technology builds on our existing infrastructure and changes the way we transmit broadband signals to make them ultrafast without the need to install new cabling all the way to a property. Once the side pod’s attached and connected, and specialist equipment has been installed in the exchange - we’re ready to take orders from communications providers. Our online fibre checker is updated so that people can see if they can get a Gfast service. The information also appears on the systems our communications providers use to order service. Using Gfast we can make ultrafast fibre available more quickly to a much larger number of homes and businesses than if we focused on ‘Full Fibre’ (FTTP) technology alone. Downloading a typical HD film (size 5GB) would take less time than it takes to make a cup of tea. Ultrafast broadband would download it in a few minutes, meaning there will be no waiting or buffering. With ultrafast broadband, it enables people within your home to go online at the same time. You’ll be able to do a number of things simultaneously such as gaming online, streaming live music, and uploading large files to social media. There’s enough bandwidth for a family of four to all stream ultra HD or 4k quality movies or TV simultaneously. Uploading is quicker and easier too, posting 100 photos to Facebook (size 300Mbps) takes a matter of seconds with ultrafast. Businesses, or small businesses operating from home, will be able to complete on a level playing field with competitors from all over the UK and around the world. Uploading and downloading large files will be easier as will things like remote monitoring, video conferencing and streaming.For example, ultrafast speeds mean businesses can transfer data over the internet faster that you can write data to a thumb drive. Plus you can download data as fast as many computers can save the data to a hard drive.